Lead Generation: For gaining potential Leads & increased conversion rate of prospect, call SolutionsHead Global Services & get trending Lead Generation Services. In simply words, the term Lead Generation denotes the creation of consumer interest for particular product or services in any business process. In today’s competing marketing scenario, leads are generated for purposes such as E-Newsletters list, sales leads or list building. Owing to the ever changing technology and social techniques, Online Lead Generation has witnessed substantial changes in the past years. Now a days, a lot many internet marketers are opting for Lead Generation Services in comparisons to unnecessary creation of campaigns, as it bears the potentiality to bring in profiting customers. And the true fact is, to keep your business in track, a steady stream of sales leads is essential. Given to current date, we will get to see that buying processes have changed and along with this transition it has become essential that marketers too change their techniques of approaching concerned customers. Thus the latest trend is to build strong relationship with buyers rather than approaching consumers through email blast and mass advertisement. Moreover, now-a-days shoppers prefer going through the products and services available in search engines and social media before concluding on their decision. This is where you have to possess a strong digital presence of your business and offers. Once clients start showing interest in your products and services, Business to Business Lead Generation will be smoother, offering additional boost to your trade. In other words, Online Lead Generation takes place the moment a visitor shows interest and makes up his/her mind to buy the offering, resulting in your profit. There are a handful of components that gets considered in the entire process of Online Lead Generation. Landing Page: Though a landing page has a number of purposes, one of the most important use of it is to capture captive lead because every visitor that visits this webpage has a distinctive intention in mind. If you are in a position to lure this visitor, you will be gained with a sales lead. Forms: A part of the landing page and consisting a series of fields, the main work of a form is to offer detailed information to your visitor about your services and products. Offer: It is precisely the information related to the offer you have made but it should be luring enough to grab the attention of your visitor and to convert them into buyers. Call to Action: Meant for redeeming an offer, Call to Action (CTA) can either be a message, button or an image on the landing page allowing the visitors to fill it out. All these components needs to be collectively linked to various online promotional channels so that traffic can easily flow in creating a smooth path for Lead Generation Marketing. Inbound Marketing: It is the process of creating awareness about your company in front of potential clients and eventually turning them into brand preference for final leads and revenue. 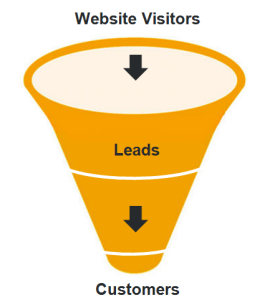 For serious amplification of Online Lead Generation, an online marketer needs to have a strong grasp over inbound marketing techniques because today’s buyers are in real control of the vendors and business holders. Social Media promotions, blog writing, strong SEO application, attractive presentation of company website and lucrative composition of website content are the vital instruments for rewarding inbound marketing. Outbound Marketing: An opposite of Inbound Marketing, in case of Outbound Marketing, it is the customer who finds you, especially through paid as well as unpaid search engine marketing techniques and is of use to intensify one’s inbound efforts. Making use of email marketing, display of advertisements, applying pay per click (PPC) ads, communication through direct mail etc are few of the key elements of Outbound Marketing. For enhanced Lead Generation , it is always advisable mix inbound as well outbound marketing methods as it will proliferate the number of views and visits. Thus we see that Lead Generation Services play a pivotal role in the Online Lead Generation process of an internet marketing company. It is one of those techniques without which effective marketing is impossible in the ongoing contest for business marketing. Whatever may be your need; we are waiting to cater them so help us to serve you better by Calling SolutionsHead Global Services back at +91-941-303-0479 or mail us at info@solutionshead.in and we will be at your service at the earliest.